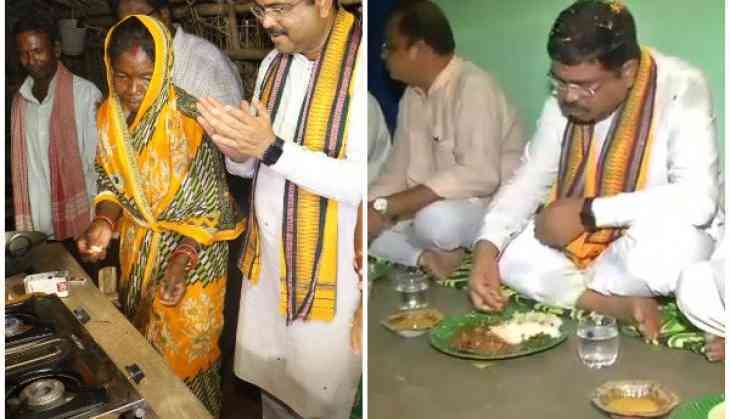 Union Minister for Petroleum and Natural Gas Dharmendra Pradhan on Sunday had dinner at a villager's house and spent the night at Haripur village in Mayurbhanj as a part of the Gram Swaraj Abhiyan. Gram Swaraj Abhiyan, an initiative taken by the Union Government, is a rural outreach programme, to connect with Dalits and counter-attack the opposition parties that target the Modi Government for its alleged anti- Dalit policies. The Union Minister launched the Rashtriya Gram Swaraj Abhiyan scheme in Haripur village of Mayurbhanj district where the houses received electricity connection and LPG cooking gas. When Pradhan switched on the light in the house of a resident of Haripur village Guru Singh, the latter's joy knew no bounds. This is one of the many families benefitting from household electrification and LPG cooking gas under the Gram Swaraj Abhiyaan. Under the scheme, the Centre has targeted to identify 400 neglected villages of the State and extend benefits of seven central schemes to every household of the villages.